HANDS ARE OUR SPECIALTY. We provide the best protection with the finest gel gloves made! Our Blue Gel gloves help prevent hand pain and numbness caused by vibration or pressure to the hands. 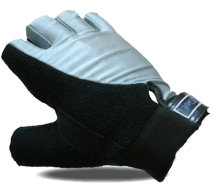 A great glove that offers digital flexibility for multipurpose tasks. Whether you are handling vibrating tools, cycling, weight lifting, doing repetitive handwork, or performing any other activity that is stressful to the hands, there is nothing quite like them anywhere! The Blue Gel glove has a soft, flesh-like gel which is strategically located at the pressure points of the palm to give hours of comfort and help protect the nerves of the hands.